Three Pipe Problem: Rubenesque: how images created vocabulary. Rubenesque: how images created vocabulary. An artist, in the traditional sense at least - deals in images to convey mood, feeling or depict a story. Through composition and lighting, they can establish worlds, set the scene for epic events or portray some of the simpler aspects of human existence. Sometimes, the images created by an artist are so inspiring, or at least thought provoking - that the style of that Artist enters daily vocabulary. "It looks like a Picasso" is an oft used phrase for any piece of art, or arrangement of objects that contain some familiar parts, within an overall aspect of asymmetry, disorder, and plain lack of realism. Such references can sometimes be applied in a derogatory sense, but not always so. Some words oscillate between positive and negative depending on context. Peter Paul Rubens was a prolific Belgian artist from the Baroque era. He was one of the most celebrated painters of the 17th Century, and definitely one of the most influential. Many of his scenes depict mythological and spiritual characters, but were prevalently used as allegory to contemporary persons and events. His now famous style developed from artistic conventions ranging back to Michelangelo's masculine (male and female)figures. He progressed this style and engendered his own unique perspective of what the human form in art can look like. In distinct contrast to popular body images of the modern era, Rubens' figures can be described as 'full figured' or even obese in some instances. Rubens seemed to have a fascination with the fuller form and in doing so makes the viewer of his works stop and take pause as to why this is the case. Traditional explanations are easy to draw out - a larger woman is a traditional symbol of fertility - this style can be seen going back to prehistoric African fertility statues. A larger man denotes power, wealth and excess. Often these characters are depicted in classical images as deities such as Dionysus(or Bacchus) - the God of wine, women and song. 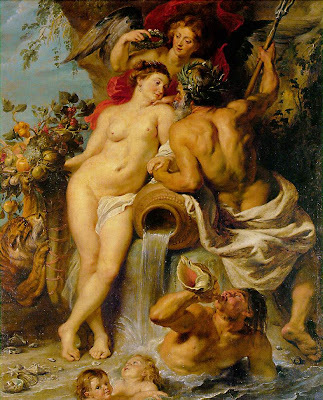 The above image The Union of Earth and Water (1618) is an iconic Rubens piece, and demonstrates his preference for a certain body type in the subjects used. Although these interpretations are quite valid, there is always the notion that there must be a personal element that drives the creator of any image to choose a particular model. It can not always be simply according to fashion or convention. If we had more information about Rubens past, and perhaps the women he had been nurtured by in his formative years - this could give us a fuller picture of the development of his striking style. It is a result of this trademark style that the term Rubenesque entered common parlance. It has since become synonymous with the description of a fuller figured female in particular. I have seen this picture in original, it is better then PC image, amazing really. Looks real and the lady is not that fat. At the time, she would be considered a slim. Rubens was a genius at a time. When you see some modern art, you see that the introduction of a photography did not do good to arts. Hello Vlad. Did you see it at The Hermitage in St Petersburg? I believe they are the current owners.